The Office of International Student Life is dedicated to supporting and empowering international students and students who are internationally inclined. ISL is also committed to the holistic development and growth of students. The office seeks to engage the hearts and minds of individuals by providing academic, social, emotional and transitional support. Augustana College welcomes students from around the world. Augustana's friendly Midwestern campus makes it a great choice for international students seeking a top education in the United States. The Office of International Student Life works with F-1 visa holders (degree seeking), J-1 visa holders (non-degree), as well as students who are dual citizens with the United States, and U.S. citizens who live abroad. Where exactly is Augustana College? 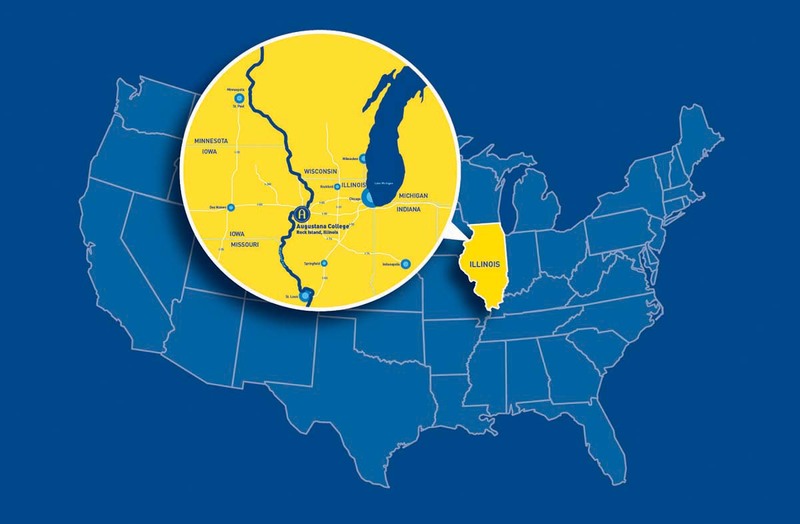 Augustana College is located in Rock Island, Illinois, which is in the Midwestern region of the United States map. Rock Island is one of the Quad Cities. When students come to Augustana, resources from all four cities are at their disposal--this creates for a well-rounded and very opportunistic academic environment. Our viewbook also has lots of helpful information to show international students what Augustana College has to offer them. The academic calendar for the 2019-20 school year is available for students to consult in making travel arrangements. For questions regarding admissions and student life, contact Liz Nino, director of international recruitment, or see the Admissions page. For visa, I-20 or DS-2019 questions, please contact Juanita Trevino Perez. Augustana's Global Ambassadors work closely with the Office of International Student Life to support incoming international students. Many of them are international students, or have lived or studied abroad and often in multiple countries. The Global Ambassadors lead sessions during International Student Orientation, pick students up at the airport, mentor first-year international students, and plan programming throughout the year. They help new students adjust to life on campus and in the Quad Cities. Meet the Global Ambassadors for 2018-19! The Office of Student Life sponsors dozens of student organizations that are open to all students. Some of the groups that may be of particular interest to international students are listed below.